Ah, Audrey Niffenegger, author of The Time Traveler's Wife. She who achieved such great fame for a book I thought was pretty good. A little confusing at times – as well as a bit creepy when the time-traveler happened upon his later to be wife as a little girl – but worth the read. 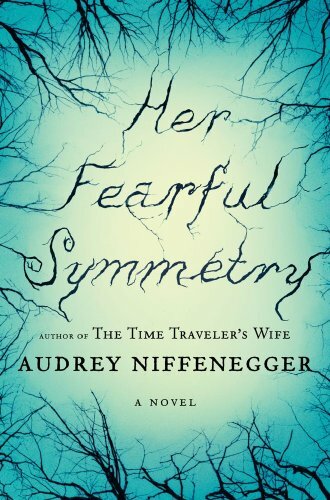 This time, Her Fearful Symmetry, a novel employing some of the same unreal, sort of supernatural/sci-fi elements, but going in an entirely different direction, veering into the creepy. The build up was fantastic, one of the best I've read in a while. Eerie, gothic, atmospheric… And, yeah, a little formulaic in that two Americans are willed – out of the blue – a property and large sum of cash by an English relative. Been there. Done that. Only, this time it was a relative they'd actually heard of. That's not always the case. Twins Julia and Valentina Poole (great last name!) move to London, into the apartment their aunt – and mother's twin sister – Elspeth Noblin (another great name!) lived in before she died of cancer. And the apartment, dank and cold, happens to be located next to Highgate Cemetery. Where Elspeth lay in the family tomb. By now my pulse was pounding! English, dark apartment, the aunt was a bookseller and her inventory was ALL RIGHT THERE, and Highgate cemetery? Reader, I swooned. How could this scenario be better? Two words: English eccentrics. Above the girls' apartment lived a man with crippling OCD, and, until she left him, his Dutch wife. Julia later befriends the man, while Valentina hides in the apartment, too shy to approach him. Below lived the former lover of their Aunt Elspeth, an incredibly reticent though utterly gorgeous man who, for the first six weeks of their residence, refused to answer his door to them – though he was to be their provisional guardian until they'd gotten settled. Instead, he chose to basically stalk them around London, creepily asking one of them, "Which one are you: Julia or Valentina?" while standing next to Valentina on the tube. Yeah, that's normal. But did I mention he's good looking? Meanwhile, back in the apartment, Elspeth begins to realize she's manifesting into a ghost. She spends her days figuring out how this whole dead thing works, determined to catch the attention of the twins. So, to recap a bit and add a few crucial details, Julia and Valentina are twins born to one sister who was also a twin. Unlike Julia and Valentina, who walk around holding hands and sleep spooned in one bed (and, also dress alike, at age TWENTY ONE), Edie and Elspeth had a falling out, a mysterious one no one wants to talk about, and they haven't spoken since shortly after the girls were born. Elspeth wills her estate to the girls, on the condition her parents never set foot in the apartment. And, the girls must live there for a full year before they're allowed to sell the property, should they choose to. Robert, the former lover of Elspeth, is writing a book about the history of Highgate Cemetery, where such famous souls as George Eliot and Catherine Dickens are buried. He leads tours of the cemetery and is of course an expert. Made me want to lay hands on a real copy of a book about Highgate. Saying a cemetery sounds yummy will sound odd, but that's exactly how the description made it sound. So, the first third to half of the book was some of the best modern gothic fiction I'd ever read, creepy elements like the twins only adding to the effect. Then, stuff got weird. Then improbable. And, finally, downright absurd, spoiling everything for me. Ach! It was like a knife to the belly! Such a fine story turned so, so preposterous. It's that dreaded 3/4 mark. Can't say it enough. So many writers completely break down between 1/2 and 3/4 of the way through a novel, losing all direction, in this case veering toward the ridiculous. It was as if a different writer, one about sixteen years old, picked up the virtual pen and finished the book off. So, so disappointing. All in all, I wish I could recommend the book, but I just can't. Read the first half or so, until things get strange, then email me and I'll just tell you the ending to save you the pain. Believe me, it's difficult sometimes having to pan a book that's this good in the beginning. But the ending simply does not match the quality of the beginning. And that's a shame. Not recommended, very sorry to say. Oh, Simon, that’s right! Your perspective on twins is first-hand. And weren’t those two a little extreme? Okay, a LOT extreme. I love the idea twins are close, but don’t believe they need to be attached at the hip. Far too cutesy and affected, all of it. And Valentina… Ugh. Can’t go further without ruining the plot. I mean more than the author did. Previous Post Filling in life’s blanks.